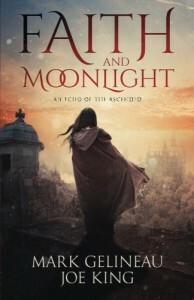 Faith and Moonlight is part of The Echoes of the Ascended which contains four different plots, in four different series, set in the same universe, but with different genres for each book. This book features Kay and Roan who enter into a magic school where they have one month to proof themselves. These were very interesting characters again. I would really like to see their dynamics and problems in the next books of these series. Also, I started to see links between the books of which I think we'll be seeing a lot more in the coming books. (And which is something I always really like to look for). This was the first round of four novellas and I really enjoyed reading them. I'm looking forward to the next batch!